Russell Coutts and Vincenzo Onorato in Rome, September 2010. 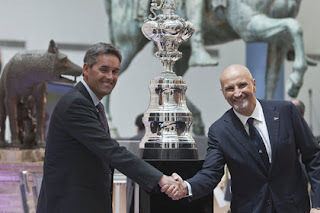 Mascalzone Latino and Club Nautico di Roma's resignation from the 2013 America's Cup would cause the mantle of Challenger of Record (COR) to pass to Artemis Racing representing the Royal Swedish YC, as per Article 6.4 of the Protocol for the 34th Defense, Artemis being chronologically the next challenger in order of acceptance. The duties of the Challenger of Record at this stage of the 34th Defense are limited. Major rules changes would involve amending the Protocol, which requires approval by a majority of the competitors, not simply the agreement of the Defender and COR. Replacing Jury members, too, requires majority consent. The COR also appoints one member to the five-member board of the Race Management organization. But most of the COR's work is already done, having agreed to the terms of the Match with the Defender and drafted the initial Protocol. In addition to negotiation of Match terms, in the early days of multiple challenges which began only in 1970, the COR's role also included the responsibility for organizing and conducting the challenger selection regatta. The 1974 COR, Royal Thames YC, withdrew from competition before they ever raced, but still conducted the regatta for the remaining challengers from France and Australia. In the 1990's the COR's race duties were fulfilled by a Challenger of Record Committee, with the nominal COR elected by the challengers. America's Cup Race Management (ACRM) will run the regattas for 2013, acting as a neutral body, though the challengers as a group will decide on their selection format.